Being blown out to sea was one the biggest fears of early aeronauts who took to the sky in balloons, for weight considerations didn’t allow for life rafts, and chances of survival were slim. Such an experience happened to “Professor” James K. Allen, a famous Rhode Island balloonist, in 1906. Allen took off in his balloon from Providence on July 4, 1906, as part of a Fourth of July celebration. The weather was threatening, but Allen didn’t want to disappoint the huge crowds who had come to witness the ascension. Allen lifted off shortly after noon time, but a few minutes into the flight he realized there was a problem with the craft’s drag rope and anchor, so he set down to fix the problem. He came down on the Bowen estate just outside Providence. (The present-day location of the former Bowen estate is unknown.) The balloon was 52 feet high and 28 feet wide, decorated with numerous flags for Independence Day, which attracted a lot of attention as it came in to land, and Allen had no trouble finding volunteers to hold the balloon down while he made the necessary repairs. Ten minutes later he was finished, and once again took off. Wind currents carried him north towards Attleboro, Massachusetts, where he lost considerable altitude, but after dropping ballast bags full of sand to attain more altitude, the balloon shot upwards to a height of 10,000 feet. Just as it was getting dark Allen realized he was passing over Provincetown, Massachusetts, on the very tip of Cape Cod, and being pushed out to sea. In the fading light he let out all five-hundred feet of his drag rope as well as the anchor which caught in the water below and pulled him down to about one hundred feet above the waves. The drag rope also served to reduce his speed, but high winds were still pushing him away from shore. With a cloudy sky and no moon, Allen found himself traveling along in utter darkness. Each time the gondola went into the water Allen was forced to drop more ballast to allow the balloon to rise up again. By dawn he had received three dunkings. About an hour later the balloon was seen by the crew of a tugboat that was pulling several barges. 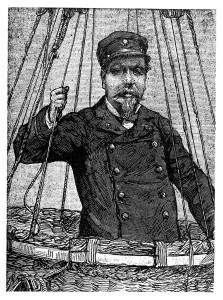 Allen signaled for help, and the tug captain cut the barges loose and gave chase, but the wind picked up and blew the balloon faster than the tug could go, and the boat’s captain was forced to abandon his rescue efforts. “I was tearing along at a pretty good pace in spite of the drag.” (rope) Allen related. 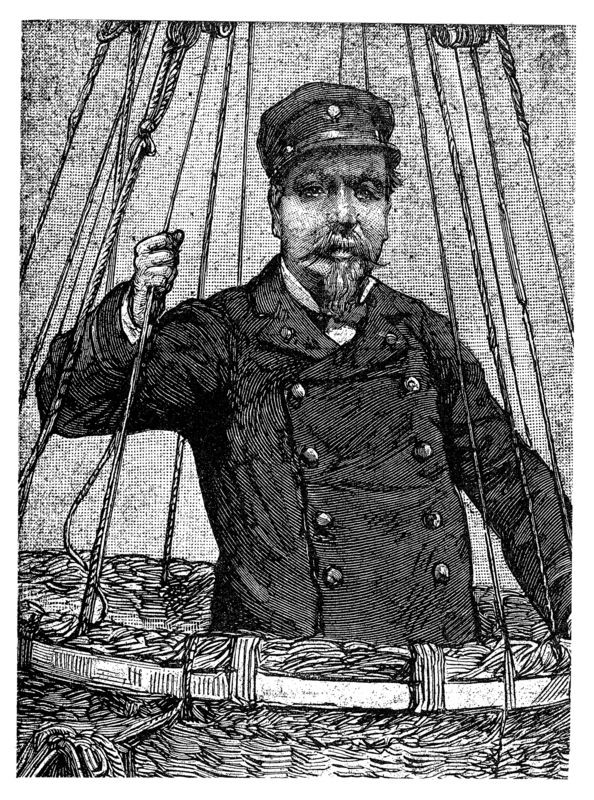 Later he came upon a fishing schooner with two long boats in the water, and the crew of one of the boats managed to grab ahold of the drag rope behind the balloon and secure it to the boat. The boat came along side to help, yet the wind was still blowing hard enough that the balloon began pulling the boats! The schooner was the Francis V. Silva out of Provincetown, Massachusetts. The location of Mr. Allen’s rescue was ten miles off Chatham, Mass. As a point of fact, it had originally been planned for Mr. Allen’s wife to accompany him on this flight. After his harrowing adventure, he was happy she stayed behind. This was not Mr. Allen’s only brush with death in his flying career. See “Providence, R. I. – July 16, 1892”, under “Rhode Island Civil Aviation Accidents” on this website. (Woonsocket R.I. )Evening Reporter, “Balloonist Is Rescued”, July 7, 1906. Thirty-five years before the above mentioned incident, Mr. Allen had another adventure in one of the family balloons. The balloon rose to over 12,000 feet and drifted over the upstate New York countryside, rising and falling at different times. After an uneventful flight, the Empyrean came down in a large tract of wilderness, and Allen was forced to climb down the tree in which it had become entangled. As he was doing so a branch broke under his weight and he landed hard on the ground below, but wasn’t seriously injured. He lacked a compass, and using his own best judgement, hiked his way to help. he eventually came to a farm in Putnam, New York, about 100 miles from Troy. The Boston Journal last week had a sensational account of the marvelous escape from death of the well known aeronaut, James K. Allen, of Providence, R.I. Mr. Allen has many friends in St. Johnsbury, and has made successful ascensions from our fairground. His adventure came near costing his life. He became suffocated by escaping gas, and would have fallen from the balloon had not his two companions caught him and held him by his heels until the balloon drifted to earth again. As the companions knew nothing about the management of balloons, it took the air ship 45 minutes to reach the ground, and when terra firma was reached the professor was crazy. His two companions declared that nothing would hire them to go up in a balloon again.